A distance-time graph shows how far something travels over a period of fasterhorizontalquicklyredspeedtime . When an object is stationary, the line on the graph is fasterhorizontalquicklyredspeedtime . When an object is moving at a steady fasterhorizontalquicklyredspeedtime in a straight line, the line on the graph is straight but sloped. The steeper the line, the fasterhorizontalquicklyredspeedtime the object is travelling. 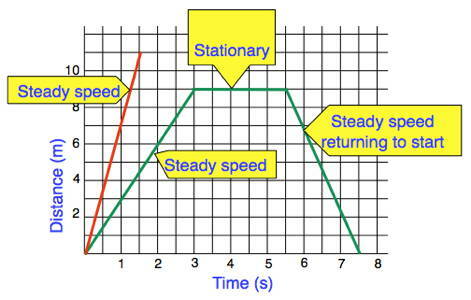 The fasterhorizontalquicklyredspeedtime line is steeper than the green line because the red line represents an object which is moving more fasterhorizontalquicklyredspeedtime .